Francis graduated from the University of Manchester in Biochemistry with medical biochemistry in 2006. He subsequently completed an MSc in Analytical bioscience and drug design at the University of Salford in 2008. He recently joined the group as a PhD student in January 2009. 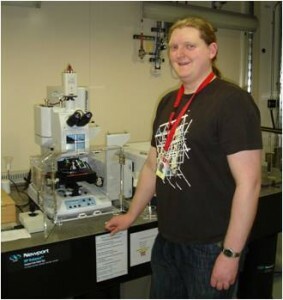 His PhD involves the use of synchrotron radiation for the analysis of single cells by FTIR. The project has close links with B22 beamline at the recently completed Diamond synchrotron near Oxford with the principal beamline scientist Gianfelice Cinque as a co-supervisor of the project. He has also conducted experiments at the Soleil synchrotron in France and the ELETTRA Synchrotron in Italy. 3 The action of all-trans-retinoic acid (ATRA) and synthetic retinoid analogues (EC19 and EC23) on human pluripotent stem cells differentiation investigated using single cell infrared microspectroscopy.